I don’t have (or want) a PayPal account—do you take credit cards? Can I pay in currencies other than the US dollar? When does my premium membership expire? Absolutely! Please make checks or money orders (in US dollars) out to Ryan Carpenter and be sure to include your member # so we know who the premium membership is for! I don’t have (or want) a PayPal account—do you take debit or credit cards? The electronic payment option takes you to PayPal’s website, but don’t let that scare you off. 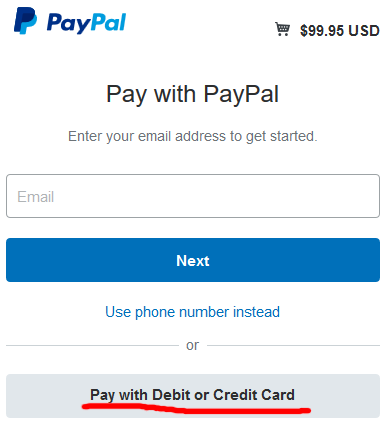 If you look at the small print somewhere on that page, typically near the bottom, you’ll find an option to pay with a debit or credit card without creating a PayPal account. Look for the link to skip the signup process near the bottom of the page. How do I cancel a premium membership? If it has been less than 30 days since you subscribed, contact us and Ryan will handle it as quickly as possible. If he is hiking a new route for Walking 4 Fun, it could be a week or two before he gets online to reply—there is often not much Internet access where he is hiking! Please be patient! He’ll still give you the full refund even if it ends up being more than 30 days before he can reply—the 30-day money-back guarantee counts as long as your message is timestamped within 30 days of your initial payment. After 30 days, there are no refunds. We can cancel the premium membership if you wish, but you may as well just let it run out on its own. We never automatically renew a premium membership! The nice thing about sending payments off to PayPal—they’ll convert all sorts of currencies into US dollars for you automatically! However, I travel a lot—particularly to Europe—and set up the system to accept payments in a few other currencies that I’ll likely always have a use for. Prices in currencies other than US dollars will fluctuate from day to day as exchange rates are constantly moving, but that also happens when you use PayPal to convert currencies into US dollars. For checks and money orders, they must be denominated in US dollars. While I do not recommend sending cash through the mail, I won’t refuse it either! Round off the amount to the nearest dollar, though. No coins! If you log into Walking 4 Fun, we can tell you! Right now, we have no idea who you are!